Our family loves to cook when we’re all together during the holidays (or maybe we just like to eat). 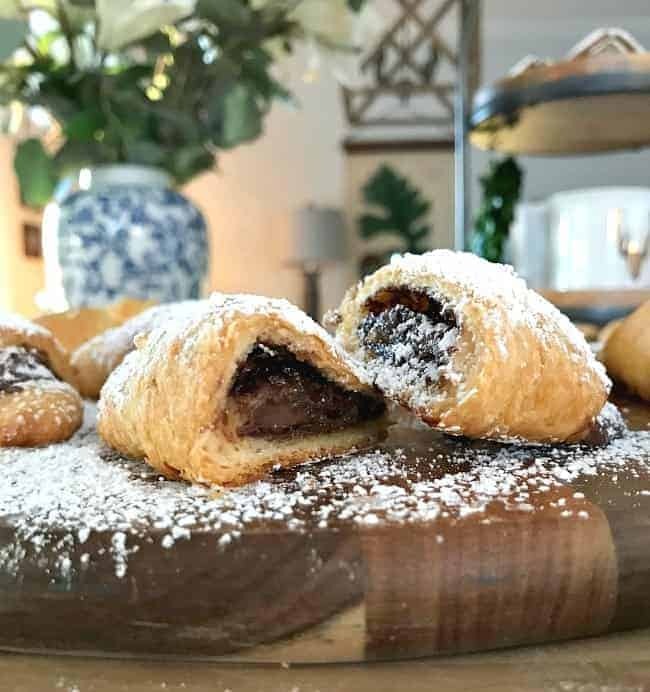 We usually make a big breakfast on Christmas morning, including French toast and eggs, and this year I wanted to make a little sweet treat for them. These easy sweet and salty Nutella crescent rolls that I came up with fit the bill. 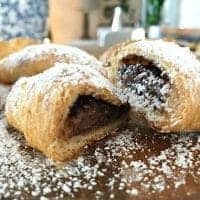 My husband is a huge fan of chocolate croissants, like totally obsessed, so this one was a no brainer. 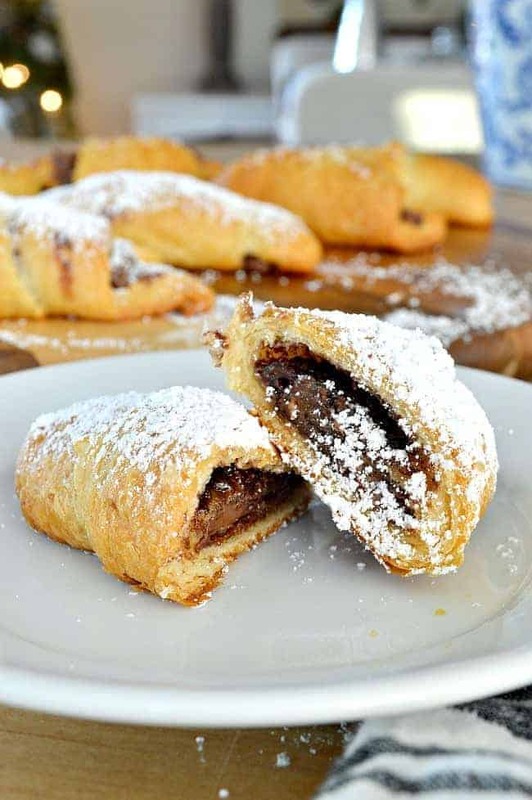 These were so easy to do, which I love, and…hello?…how can you go wrong with Nutella? 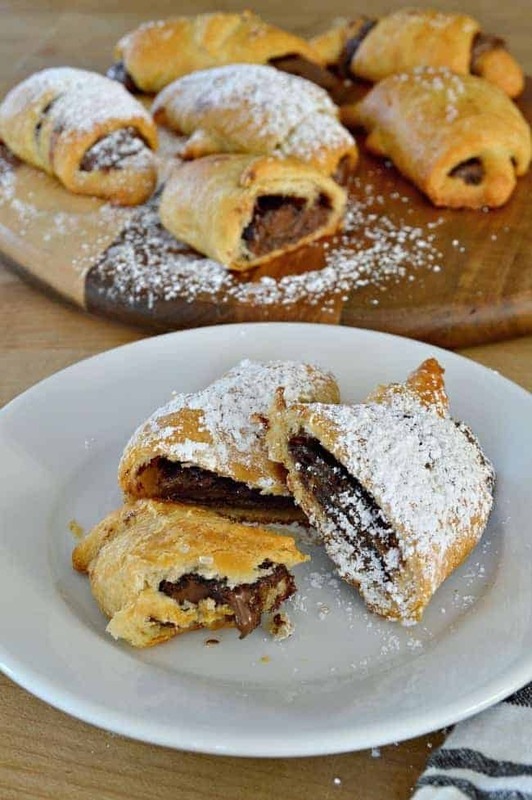 The plan was to make the Nutella crescent rolls with a dusting of powdered sugar on top. Now, I am not a huge sweet treat fan so I didn’t plan on eating any. When I was making them though, I decided to sprinkle a little coarse salt on half of the rolls at the last minute. I may not like a lot of sweets but give me a jar of Nutella and a bag of pretzels and I am happy. I did a bit of test baking last week to see how they would turn out. You guys, OMG…I loved the salty ones and, of course, the hubs couldn’t get enough of the sweet rolls. They passed our taste test so I’ll be making them on Christmas morning for the whole family. Hopefully the kids will like them as much as we did. 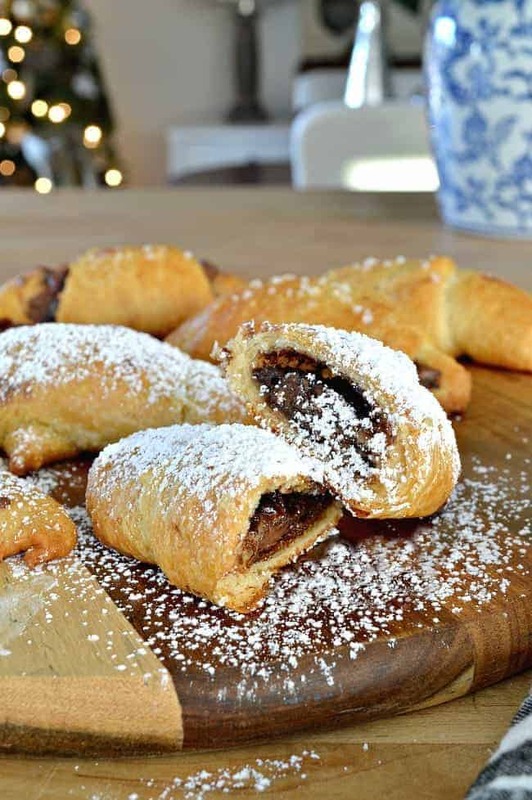 What goodies do you make for breakfast Christmas morning? A fun and easy sweet and salty breakfast treat. You can also check out a few of my easy cookie recipes. We’ll be spending our holiday with the girls this year so I don’t plan on posting (that could change of course). I’m hoping to catch up with my girls, eat good food and get in a little reading. 🙂 I’ll definitely share our fun from Denver in my IG stories if you want to see what we’re up to. Thank you all for supporting this little blog this past year and helping it to grow. I’m looking forward to exciting things in 2018. This year I am going back to my son’s house to sleepover for Christmas morning. My grandson is all excited to have a sleepover with Nana at his house. I am very thankful for the kindness of my daughter-in-law to think of inviting me. I don’t know what I would do without her. Have a wonderful Christmas with your husband and daughters! Nice! My hubby has a chocolate fixation, these would be nice for him. I am an oddball health nut and do not eat sugar or grains. 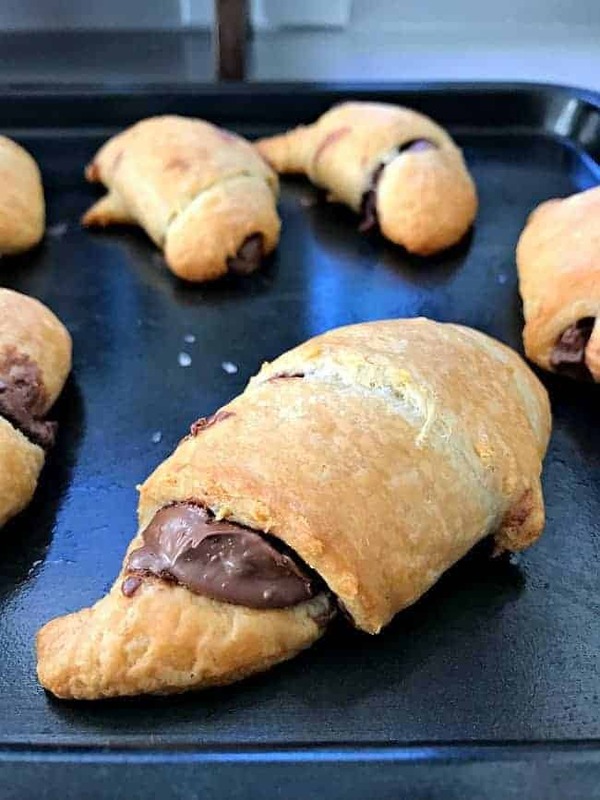 However there is a nutella recipe on one of my other favorite blogs (All Day I Dream About Food) that I have been wanting to try.We have always made Bear Claws on Christmas…a little more work than I prefer these days but can still do. Wishing you a wonderful holiday with your family, such a blessing that they join you. Love Bear Claws! I can easily do without sweets whereas the hubs can’t live without it. Once the holidays are over, I’m cutting a lot of it out (to see if it helps my Essential Tremor). 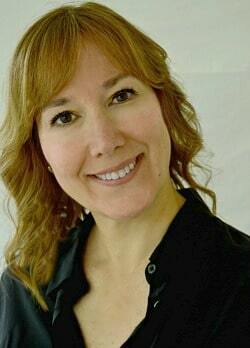 Love hearing about new recipes (and new to me blogs). I’d love to hear how it turns out if you try it. I plan on trying them BOTH ways – and maybe even together! Sounds wonderful. Have a good time & a wonderful Christmas with your daughters. Both ways…together? You are living on the edge, my friend! 😉 I wasn’t counting on the salty ones to appeal to me, I thought they would be too sweet, but I was so wrong. Let me know how yours turn out if you make them. Remember to bake them so long enough so they’re good and golden. My first batch could have used a few more minutes in the oven. I am weird I guess because I do not like Nutella. My husband and I used to eat cinnamon rolls until Pillsbury changed their recipe. Then we would gather with my mom and sisters for a big breakfast of eggs, biscuits and gravy, bacon, sausage and mimosas. My mom died two years ago and everyone kind of drifted into new traditions so this year will be breakfast as usual alone. My son does take me for seafood on the ocean for dinner so that is taking place of old traditions. Merry Christmas, safe travel and enjoy your time with your girls. So sorry you will be alone for breakfast this year but I’m happy to hear you are creating new traditions with your son. Wishing you a Merry Christmas Debbie!